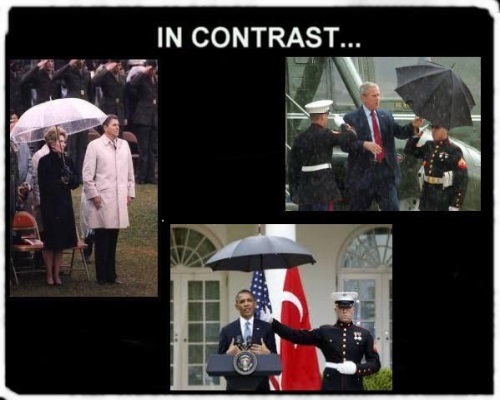 An umbrella can tell a lot about his character. There are those who will weather the storm. Then there are those who manage their own storms. Finally there are those want the umbrella held for them. This graphic doesn’t show why Obama is having the worst week of his “career,” and he has had many. Obama should have been unceremoniously removed from office long before now, as he has proven time and again that he believes himself to be above the law. Obama’s behavior is no doubt influenced by the communist, so-called intelligentsia who surround him, as it is difficult to believe that one man could be so destructive on his own. Regardless, Obama’s narcissism, and his cynicism and disdain for Americans–ALL Americans–is front and center. If we don’t do what is needed to put our foots on the neck of Liberalism, shame on the Conservative movement.